Have fun sharing quality time together. Unlimited bowling for up to six people per lane. Rental shoes extra. Bowl all you can for only $5 (rental shoes included). Food and beverage specials all night! Show your Food Workers Card or MAST Permit to get in on this special. Unlimited bowling. Rental shoes included. 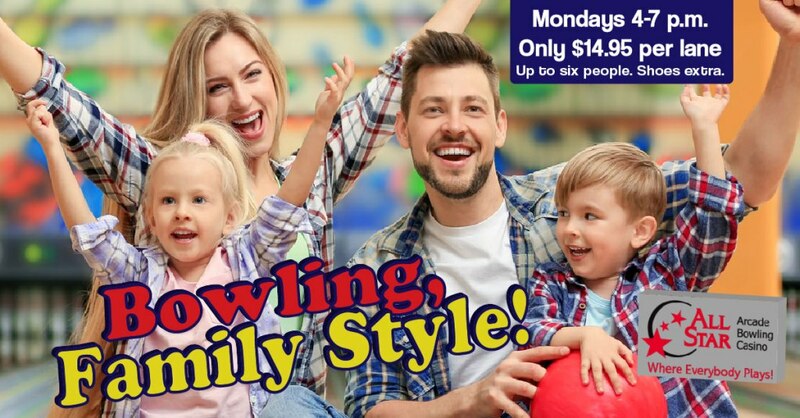 Bowl three games for $10 per person plus tax. Shoe rental included. Start the weekend off right! Bowling for up to six people per lane. Rental shoes are extra. Same day Friday Night Out reservations must be completed by 4 p.m. Gather your family and friends for some much needed weekend fun. Join us on Sundays from 9 a.m. – 2 p.m. for Kitsap’s best in family entertainment. 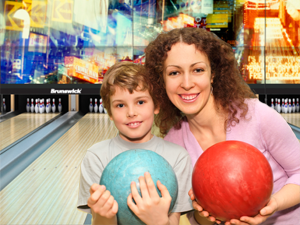 This $55 package gets you one and a half hours of bowling for up to 5 people, shoes included. PLUS, each guest will receive a $5 arcade FUN Card. Come to All Star and make Sunday your family FUN Day! Eats, treats and drinks are always available at All Star. Please do not bring in outside food or beverages.